At long last we seem to be experiencing weather that we can relate to Spring! The conditions for fieldwork at the High Pasture’s site have certainly improved and the project team have been able to progress their investigations within several key areas of the site. Gemma Cruickshanks, an archaeology student from the University of Edinburgh, has joined us on site to assist with fieldwork while we have also had a number of volunteers from the local community. The excavations in Trench 7, which were initiated to investigate a possible ‘roundhouse’ structure above the cave, are progressing well. The natural karstic clay and areas of protruding limestone bedrock have been revealed covering over half of the surface area of the trench, mainly along the west side. We recovered few finds from the sediments above this horizon with the exception of one small abraded prehistoric pottery sherd, several pieces of worked flint, a pebble tool (grinder) and a small iron concretion. Pockets of fire-cracked stone and pebbles were found within these layers and the sediments were flecked with small pieces of charcoal. 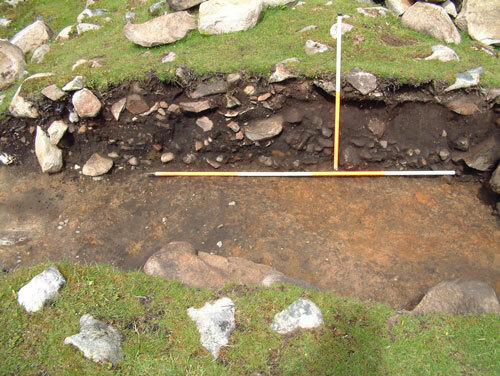 However, no definate floor layer was uncovered to suggest this structure was of domestic use. The image above shows a number of features revealed by the excavations in Trench 7 including a possible pit and post-holes. The potential pit is represented by the dark area of sediment, which includes fire-cracked stone and pebbles, while the post-holes appear to be arranged around this and are heavily flecked with charcoal fragments. Several of the features have been selected for further investigation and have section lines set-up ready for excavation. Excavation of the pit-type feature revealed a shallow scoop in the natural karstic clay filled with a brown homogenous sediment containing fire-cracked stone and a few charcoal flecks. The images below show two of the post-hole features, F701 and F703. 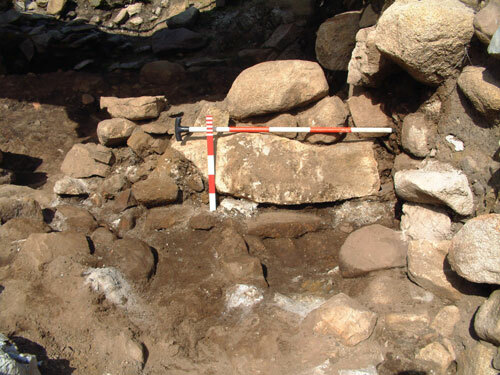 The image above shows post-hole feature F703 after section excavation, which again contains a large packing stone. The feature also contains a dark sediment with numerous charcoal lumps. However, what came as something of a surprise during the excavation of this feature was an in-situ burnt wooden stake, which appears to have been driven into the natural clay. 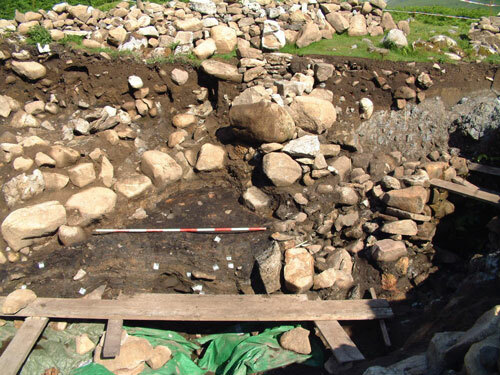 Excavation of the next post-hole feature to the north of F703 has also produced in-situ burnt wooden stakes, that have also been driven into the natural clay. Investigation of these features will continue this week and we hope to report back on these in due course. The excavation of Trench 5 was also completed during the past week and recording is now in progress. 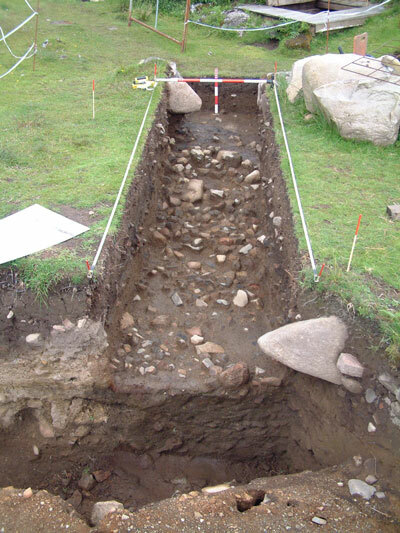 The revetment wall that was uncovered between this trench and Trench 2 has now been removed, while the continuation of the wall has been uncovered curving gently to the south west. Gemma recovered a fine pebble grinder tool in the fire-cracked material here, just above the natural clay. 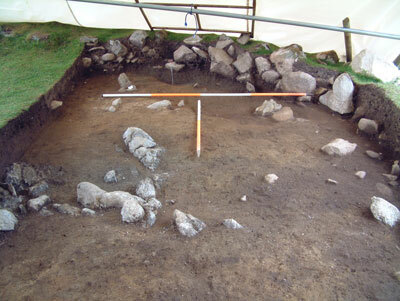 The excavation of Trench 5 has provided evidence to indicate the formation of a burnt mound in this area of the site, on to which stone-built structures had been embedded. The image below shows the south-facing section of the trench. The burnt mound material is of a more even depth here and runs continuously across the trench (scales = 2m and 1m). Work is also continuing in Trench 6, which is located underground in Bone Passage. We are presently reducing the standing section in the trench so that we can clean down onto context C604, a charcoal-rich layer that appears to be associated with access to Bone Passage via the man-made stairwell. The surface here will then be planned, before we resume excavation in the trench. Removal of spoil has been greatly facilitated now with the opening of the stairwell and original entrance to the cave. A wooden gantry and platform has been constructed above the stairwell and spoil is lifted to the surface using a pulley system and rubber buckets. The sediments from the cave are subjected to 100% sampling and wet-sieving, so that we can obtain the maximum recovery of data from this important area of the High Pasture’s site and minimise any bias in the recovery of material. 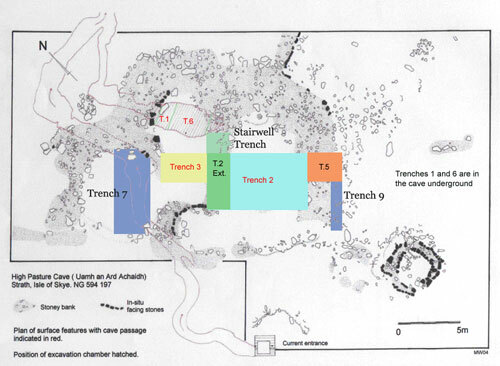 Work in Bone Passage in 2004 and 2005, and the post-excavation analysis of the material recovered, indicates that deposition of material in the cave was area specific - both in the vertical and horizontal plane. Preservation of artefacts and ecofacts is also remarkably good in the cave, and it is vitally important that we maximise recovery to enable informed interpretations to be made regarding the use of the site. 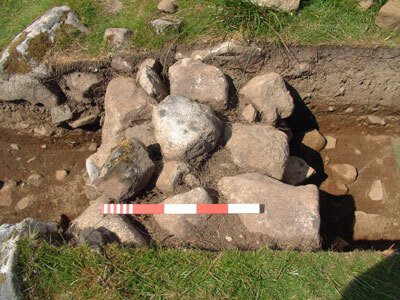 Organics are rarely so well preserved on Late Bronze Age and Iron Age sites, so we can utilise this valuable resource in helping us to reconstruct the economy and resources of the people living in Skye and the surrounding Highland & Island landscapes during these important times. 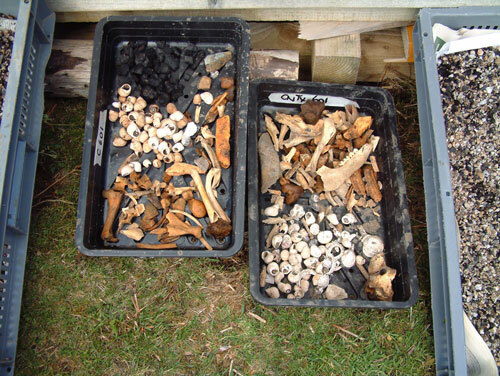 The image above shows the wide range of ecofacts recovered from the cave sediments in Bone Passage including animal, bird, fish and amphibian bone; well-preserved charcoal and plant remains; and shellfish remains. Pollens are also well preserved, while the excavations continue to recover a wide range of artefacts including stone tools, ceramics, bone and antler work. 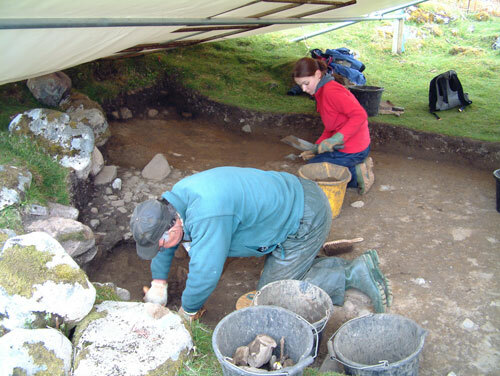 Visit the website again soon to catch up on progress at the site, or why not pay us a visit and see the archaeological work in progress at first hand. We are on site Mondays to Fridays, weather permitting!! We visited the site on the recommendation of the local bookshop in Bridge of Allan and we were very impressed with the hospitality we received and the personal guided tour.